Government officers and workers will enjoy a 7-day holiday for the 2018 Tet (Lunar New Year), from February 14 - 20, 2018 (on December 29- January 5 of the lunar calendar). 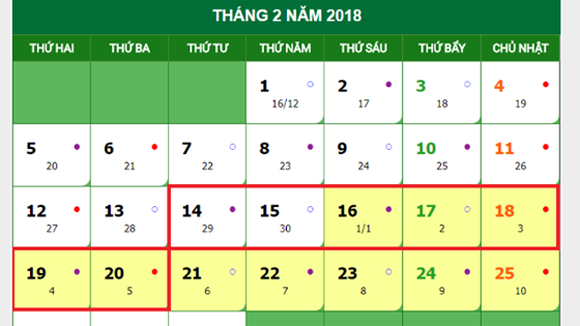 Prime Minister Nguyen Xuan Phuc has approved the suggestion by the Ministry of Labour, Invalids and Social Affairs (MoLISA) for the seven-day holiday for the upcoming Tet (Lunar New Year) holidays in the government's regular cabinet meeting on December 5. The Government leader asked agencies and units to arrange work based on their plans during the holidays to ensure the fulfillment of their tasks and serve the people.